Billy is a spirited, good-hearted young man with dreams far bigger than the Valley of the Yew. It isn’t that he minds working alongside his father in The Valley’s Finest Inn. He could find a future happiness if he stayed. But when a noble guest invites him to go on the road with her, Billy leaps at the chance to make his dreams come true. Little does he know that the world beyond his cozy home is a more hostile place than he could ever have imagined, filled with dangers from which his father has done everything in his power to protect Billy. Dancing back and forth between a unique idea for younger readers and one for older audiences, The Innkeeper’s Son stands strong in a place of universal appeal. There’s a delicate balance between the silly – lending itself to younger readers – and the darker, more mature themes that highlights K.C. Herbel’s skill. 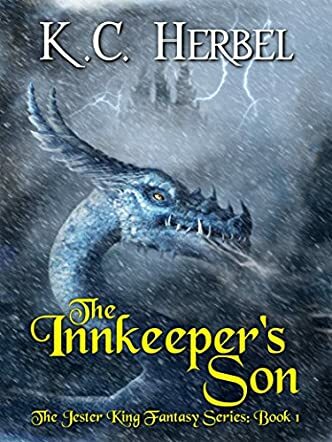 The effort made to make The Innkeeper’s Son such a solid work shines through every page; from the quiet strength of the common folk to the imbuing of life into the land and animals, Herbel never disappoints. There are a few rough spots scattered throughout, but none great enough to mar the first installment in a new fantasy series that should definitely be on your bookshelf. It's a fast read, even taking into account the frequent pauses I took to admire the scenery. Herbel paints a beautiful landscape through the eyes of Billy, the young protagonist who sees the world with a child’s wonder even while confronting dark forces he’s never before known. Indeed, there is an unmistakable sense of magic to the countryside of The Innkeeper’s Son, drawing a sense of wonder and respect for the natural world into the whole work. Billy’s innate response to despair in himself and others adds much-needed lightness for those around him, earning him a cherished place in the hearts of most everyone he meets. Herbel does not shy away from allowing each character to have their own private pain, giving them a depth that cannot be overrated. A truly magical journey, and a delight to read.